The Wedding AlBUM Coming Soon! I am super psyched about September. This month is very special to me because on September 29th, 2012, I married my wife Callie Sharon. On March 28-29, at Austin Texas's Institution Theater, I recorded my first full-length DVD and my second CD, The Wedding AlBUM! 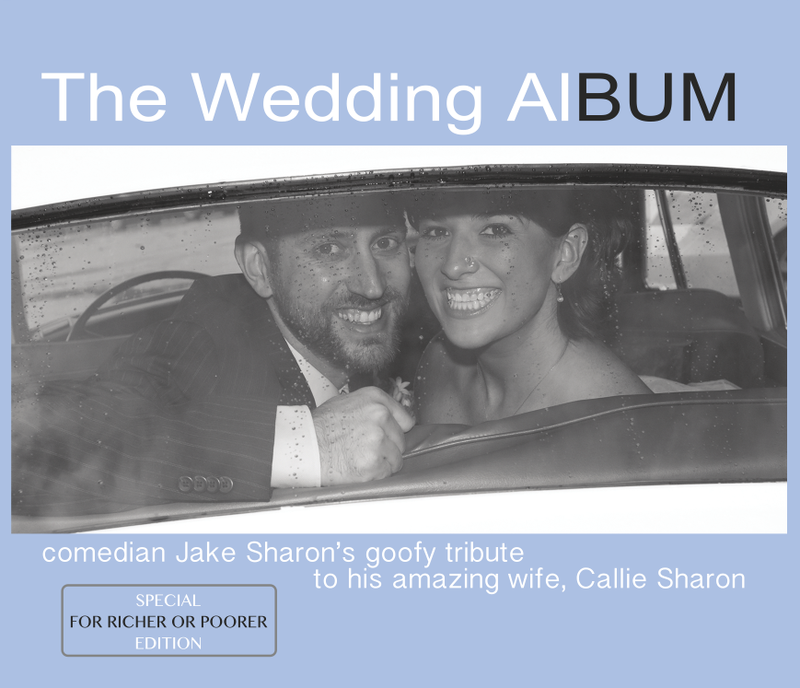 I'm dedicating The Wedding AlBUM to my amazing wife, Callie Sharon. I am so excited to tell you The Wedding AlBUM is turning out amazing! We are right on track for our September 29th release date. I can not wait to share this with you! THE WEDDING AlBUM CD & DVD! The Wedding AlBUM CD is done and the sound quality is just astounding. I was surprised and delighted to hear how crystal clear it sounds. When you listen to it, you will feel like you are there. The Wedding AlBUM DVD is wrapping up shortly. We are putting some final touches on the main video. You get the exact same sound quality you get on the CD- plus the best video anyone has ever shot of me. We've got some great bonus features and we are working on a couple more. Also, one cool decision we made is to make sure the DVD and CD are different. There is a lot of overlap in content, but both the CD and DVD will have moments you will only get to discover if you check out both. Also, The Wedding AlBUM is both a CD and a DVD, each sold separately. But, to reward my Kickstarter backers, as well as those of you who order the pre-release, you can get The Wedding AlBUM limited edition CD/DVD combo (while supplies last). I am only making 100 of the special edition version. 25 are already going towards my Kickstarter backers. I have to give 1 to my wife, Callie. I mean I did dedicate it to her so maybe she should get a copy. After I send a couple copies to reviewers and such, that means I only have 70 or so The Wedding AlBUM limited edition copies left for you. Out of those 70, many of them will end up being sold at my live shows. So get yours while you can! I will be updating the site with a link to the pre-sale very soon! COME TO THE WEDDING ALBUM RECEPTION/ RELEASE PARTY SEPT 27! When I originally came up with The Wedding AlBUM concept, I decided to have the reception/ release party on September 29th, Callie's and my 2-year-anniversary. But since the 29th is on a Monday, a school night, we are having the party on the 27th instead! We are throwing The Wedding AlBUM Reception/ Release Party at the same place where we recorded The Wedding AlBUM, The Institution Theater. There will be stand-up, some toasts, improv by Callie's and my improv duo (The Couchsurfers), a CD/DVD signing, a dance party (with cake), and more! So, the Wedding AlBUM will release to the public on September 29th, but if you are in Austin, TX on September 27th, come to the party and pick up your copy early! In the next few weeks, I share details about the The Wedding AlBUM pre-release so you can reserve the special edition CD/DVD combo of The Wedding AlBUM before it sells out. Also, I will share details about The Wedding AlBUM Reception/ Release Party. If you have any questions, comments, or concerns, leave a comment here and I will talk to you about it. I have to say I am so proud of The Wedding AlBUM, The Institution Theater, Voltaic Video (The Wedding AlBUM production crew) and most of all, you guys. Thank you so much for all your support.